For five years I have been sharing my thoughts about food, family, entertaining and all manner of things food related. And you, dear reader, have followed along for the ride. 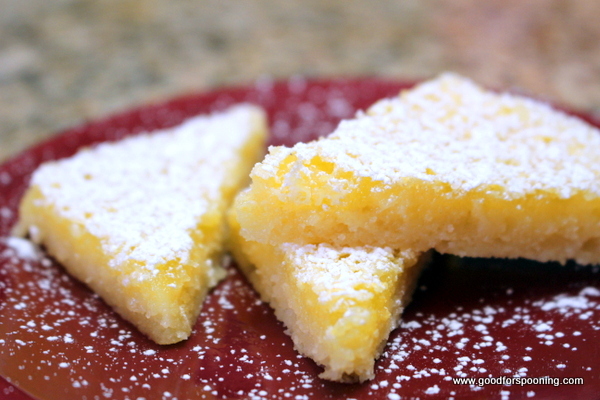 I have taunted you on Facebook, Twitter and Instagram with notes and pics about Lemon Bars. And I have posted tons of pics of food, chefs, silliness and fun. And you have all stuck with me. I thank you. I have tried to be my authentic self, knowing that I won’t appeal to everyone. Across those five years I have shared glimpses into restaurants, interviews with chefs, rants and pet peeves. And still you like me. Go figure! I have tried to be my authentic self, knowing that I won’t appeal to everyone. I am not trying to. I know that the “Susie Creamcheese” people who are offended by foul language, sexual innuendo and snarky behavior will never like me, so I am not trying to please them. I am just sharing what makes me tick with anyone who wants to come along for the trip. In five years I have also shared a smattering of recipes. I keep promising to do that more and I fail. It’s not because I don’t WANT to share them with you, it’s because I forget to take pics of the process and finished product. 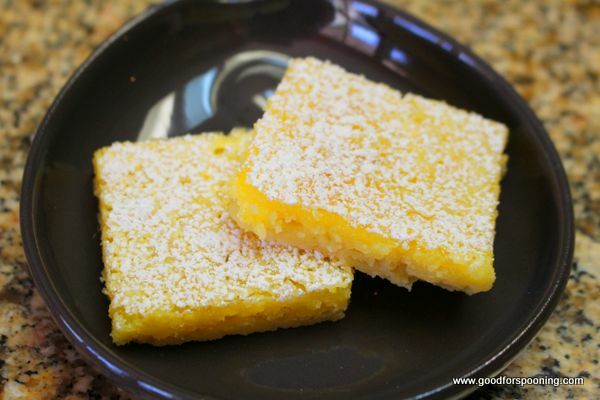 As a gift to you dear reader, because so many of you have asked…here is the recipe for Aunt LeAnne’s Famous Lemon Bars. I know I promised I would never share it, but I have decided to break that promise. My main reason for not wanting to share it is this: if everyone knows how to make them, no one will invite me to make them. Whenever I am in doubt about what to bring to a chef’s house, THIS is what I make. I know they will be perfect and they will get eaten and many of the chefs I know hate to bake, so they appreciate a dessert. Because I cut them into triangles most of the time, Chef John Courtney says they aren’t bars…whatever. What I love about this recipe is that it has the perfect crust to filling ratio for me and my family. Not too thick, and just the right sized bite once cut into squares or triangles. I specify a metal baking dish because the recipe works best with metal. I have tried glass and stoneware, but metal creates the best crust. Lining the pan with foil allows you to lift the bars out all at once and move them to a cutting board for cutting. Line a 9×13 metal baking dish with aluminum foil. Spray with non stick cooking spray. 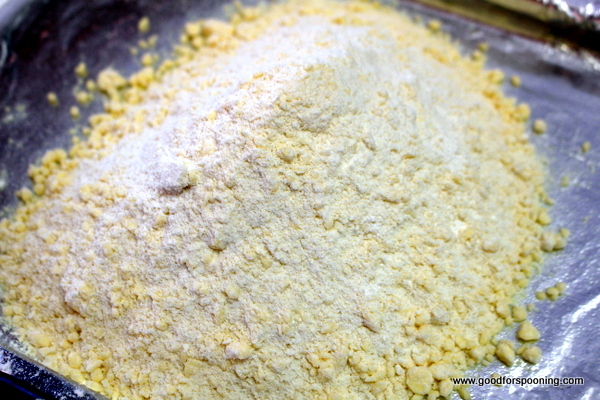 Combine all the ingredients for the crust and cut in the butter until the mixture resembles coarse sand (to speed up this step, you can use a food processor and pulse until correct consistency is reached). I use a food processor and pulse the blade to get this texture. The French butter from grass fed cows is what makes it so gorgeously yellow. 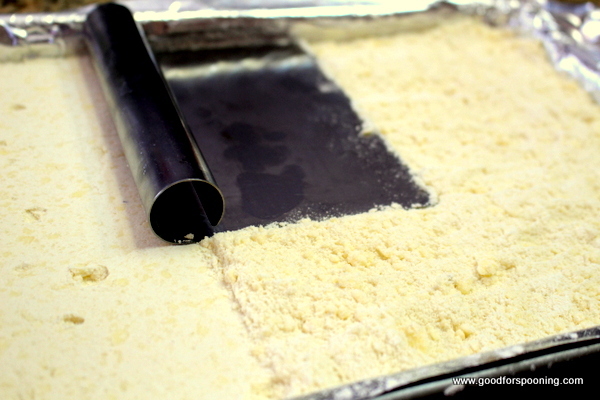 I use a bench scraper to push the crumbs into the corners and flatten it out evenly. Just lay the bench scraper onto the crumbs and press straight down, flattening each section as you go. Bake 15 minutes or until the edges JUST start to become golden. See how the edge is just barely browning? yeah…that. While the crust bakes, zest both lemons and juice them to equal ½ C of juice. Using an electric mixer, beat eggs until thick and lemon colored. Add sugar, juice and all of the zest. Whisk together flour salt and baking powder. 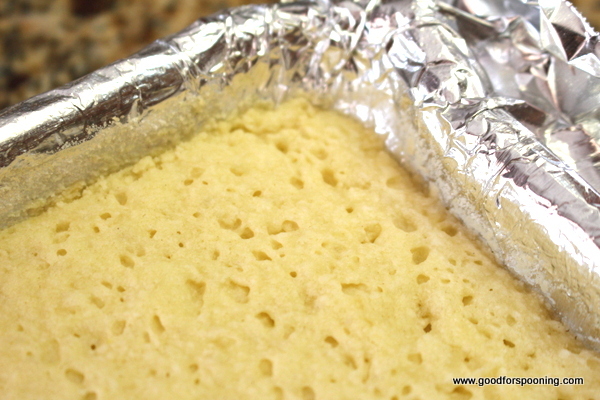 Immediately before pouring onto the hot crust, add flour mixture to the egg mixture (If you add it early in the mixing time the mixture becomes too foamy). Pour filling onto hot crust and return to oven for 15 minutes or until filling is set and just lightly golden brown around the edges. Remove to a wire cooling rack and sprinkle with confectioner’s sugar. Cool completely. 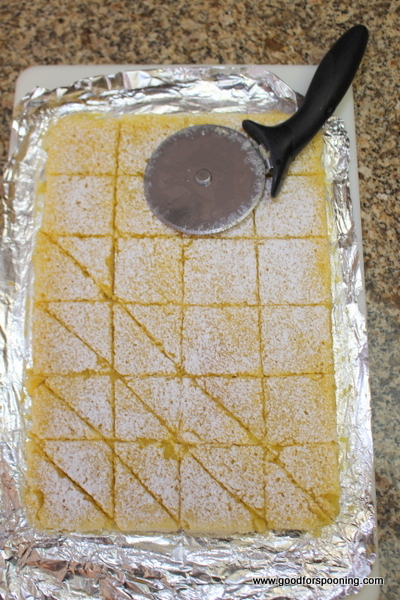 Cut into bars or triangles. Cut into squares and then diagonally across each to make triangles if desired. I use a moist pizza cutter to glide through. Wash it off if it gets clumpy and start again. TIP – If you want them less tangy, use less lemon zest. And remember, I don’t monetize my blog like so many others. The payment I get is when you share it and invite your friends to read, follow me on social media and post your comments. What I’d really love is if you make the recipe and post pics of your results on my Facebook page or tag me on Instagram when you make them! Maybe on the 10 year Anniversary I will share Nettie’s World Famous Chicken Salad…probably not.